See what I did up there? Balls. Because the Tall Man carries around that silver ball thing. Whatever. I thought it was cute. As we discussed here on Halloween Love last week, fan-made documentaries that dig deep into our favorite horror movies and franchises have become all the rage in recent years, and that love has also been spilling over into the world of books. Yep. Books. They still exist, even though the stores that sell them do not. Take that, technology. 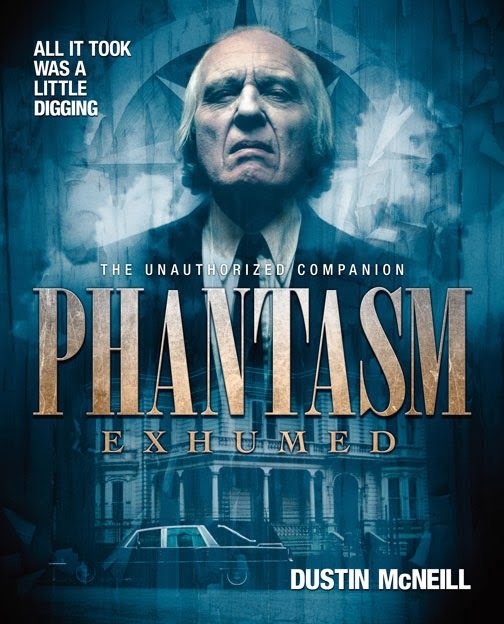 Following in the footsteps of books like Crystal Lake Memories and Jaws: Memories From Martha’s Vineyard, Phantasm Exhumed will tell the untold stories of the behind the scenes making of all of the films in the phan-phavorite Phantasm franchise… yep, all four of them. The brain child of a phan (last time, I promise) by the name of Dustin McNeill, Phantasm Exhumed has been in the works for a couple of years now, and to say that McNeill has poured his blood, sweat and tears into the project would quite frankly be a huge understatement. Through interviews with members of the casts and crews of the films, McNeill has impressively pieced together day-by-day accounts of the productions of all four installments in the Phantasm franchise, making this a retrospective that far exceeds anything the home video releases of the films have ever provided for us. Sure, we’ve all seen and read interviews with guys like Don Coscarelli and Angus Scrimm, but McNeill dug a whole lot deeper than that, reaching out to and conducting interviews with everyone from the first victim of the Tall Man’s silver sphere to a Universal Studios executive that has stories to tell about Phantasm 2 that even the biggest fans of the franchise have never before heard. One of the most exciting aspects of Phantasm Exhumed is the inclusion of rare journals from star Angus Scrimm and Phantasm 2–4 crew member Kristen Deem, which span the making of all four films. These journals will provide unprecedented access to the franchise, and the book will represent the first time they’ve ever been published in any way, shape or form. The book will be filled not just with walls of informative text but also hundreds of photographs, most of which are of the never-before-seen variety. McNeill says that he ended up collecting so many incredible photos from cast, crew, set visitors and fans that he couldn’t possibly even fit all of them into the book, so expect some of these rare shots to soon spill over onto the Phantasm Exhumed website. Leaving absolutely no stone unturned, McNeill has been waist deep in call sheets, storyboards, outtakes, effects artwork and script drafts for the last couple years, and the results of all of his hard work will soon be available for the consumption of fellow diehard fans of the franchise. Phantasm Exhumed is gearing up to burst out of the mortuary, and you can keep up to date with the book over on the official blog. I leave you with a rather fitting vintage video, which is a personal favorite of mine. This footage was shot at the 1988 California premiere of Phantasm 2, where a special hearse-stuffing event was held. You’ve just gotta love the 80s!